﻿﻿﻿When you work for a children’s hospital, innovations aren’t limited to new devices and new treatments. 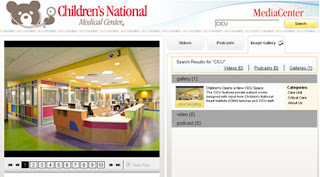 In the last few months, Children’s National has opened some new patient care spaces that are technologically advanced, but also employ some innovative tactics to make the time a child spends with us less stressful all around. Check out the images from our new Imaging Center in Montgomery County—every room is designed in a different theme. And the location makes getting pediatric imaging services easier for parents who live in the areas around Washington, DC. At our main Sheikh Zayed Campus, we also recently opened a new Cardiac Intensive Care Unit. The state-of-the-art unit combines advanced care and research technologies, with a design that is centered around families and healing. Sometimes the innovations with the most immediate impact are the ones that make a procedure like an MRI or CT scan less scary for kids, or make a long, stressful stay in the hospital a little more comfortable for families.